Requirements: Registered with BSA, 18 years or older, and have some experience and basic knowledge of rappelling and climbing. 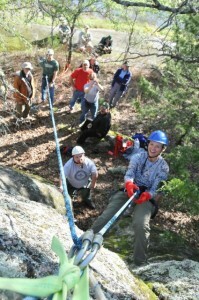 16 years or older can obtain a “Climbing Instructor in Training” card. Purpose: Earn a Climbing Instructor card. Learn climbing and rappelling methods and techniques, BSA requirements and recommendations to provide a safe high adventure climbing program. Purpose: Training will be provided on both the Low course and High course elements. The program includes actual participation in the elements as a hands-on training experience (have fun like your Scouts for a couple of days). Bring to Class: Lunch. Water bottle, Receipt of your $15.00 payment, ENTHUSIASM. Participants that are 16 and above can either get a COPE or Climbing Instructor-In-Training card good for 2 years. Your BSA medical form should be current.